Jimmy Young was a star for Montgomery Central High in Clarksville, TN. Playing for his father, Jimmy Young Sr, Young averaged 35 Ppg his senior season on his way to a All-Tennesse selection in 1967. Both of his parents were alumni of Western Kentucky, (his father even played with then Western coach John Oldham) so naturally his desire was to be a Hilltopper like his parents. "His daddy told me Jimmy could play, and I have a lot of respect for his judgement," said Oldham, "but the night we saw him play in high school, he didn't look good at all. However," the Western coach added, "I'm willing to admit we made a mistake." When Murray State coach Cal Luther came looking for a guard he found a ready and eager Young. "We were crazy about Jimmy right off," said Luther, "and He knew we wanted him." After a visit to Murray, Western didn't stand a chance, Jimmy was set on joining the Thoroughbreds. 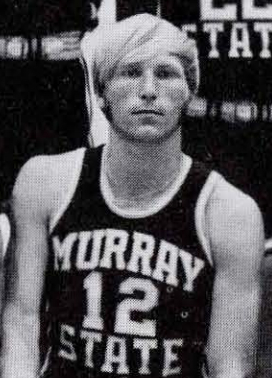 Young started his time at Murray on the freshman team averaging 21.6 Ppg, leading the Baby Racers to a 10-7 record. His sophomore season would be a memorable one as Jimmy was joined by fellow Racer greats Claude Virden and Hector Blondet. The Breds surprised everyone by winning the OVC Championship and a berth in the NCAA Tournament. By the end of his junior season, Young had earned a reputation as one of the toughest competitors in the OVC. "Soft-spoken and nice, until they turn out the lights for the Anthem. Then he changes," said his coach. "There are games in which he refuses to let us lose." Jimmy would be honored for his play by being named to the All-OVC second team by the Conference and the Louisville Courier Journal. "Soft-spoken and nice, until they turn out the lights for the Anthem. Then he changes"
In his final season, Young earned the reputation as a long range marksman. Opposing defenses wouldn't let him near the basket so he would shoot it where he could. And despite having to take mostly long shots, he still managed to sink over 50% of his shots. 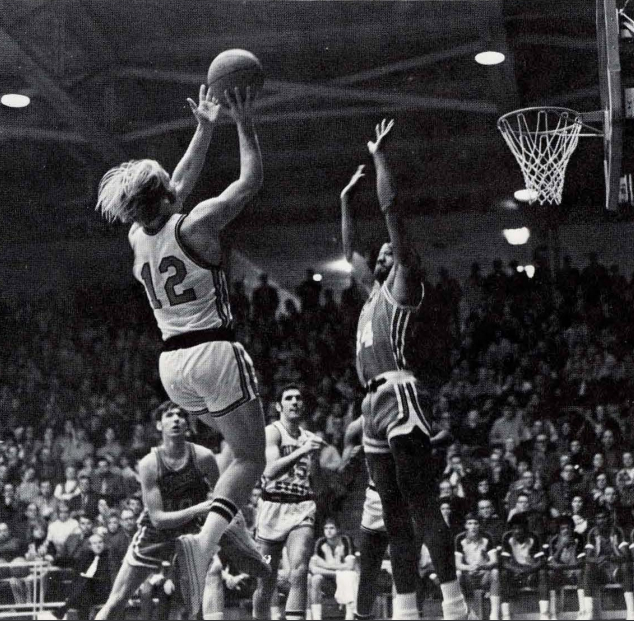 Young told the Courier Journal in 1971, "I'm not bragging, but I have confidence in my shooting. I just feel like everything I throw up there is going to go in." "That long one I hit against Western," He added, "I was so far out Jerry Dunn didn't think I was gonna shoot so he dropped off on me. I said to myself, 'Heck I'm gonna bang away at it.' 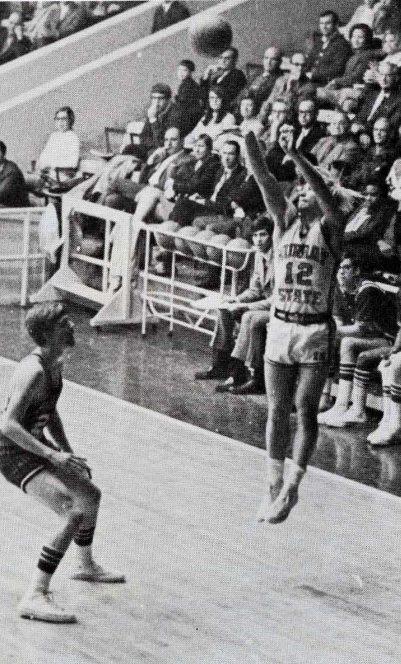 I sort of surprised myself, and after the shot I realised how far out I was I said to myself, 'Good thing that one went in'"
Bennie Purcell, who was an assistant at the time said later, "If we had the three-point shot in those days, I know he would have averaged 30 to 35 points a game." "He was the best long-range, pure shooter that's ever been here," Purcell said. "He was a very hard-nosed player and aggressive. He gave 100 percent every game." Jimmy relished the competition and the excitement of the big games which drew the largest crowds. "I just tingle every time I think of the big ones coming up," Jimmy said. "I've been playing this game since I was knee high to a grasshopper, and the more a game means the more fun it is to play it." At the end of the season Jimmy was once again named All-OVC by the conference and media. Young finished his career 7th in scoring with 1128 points, 5th in field goal percentage at 47.7%, and 1st in Free-Throw percentage at 84.6%. After graduating college, Jimmy returned home and succeeded his father as basketball coach of his former high school team in 1983. Young still coaches there and doesn't plan on stopping anytime soon. He applies the same attitude to his players now that he had as a player for Murray. "I still have a lot of energy and I keep myself in good shape. I still have passion for the game and I love doing what I do. It's stressful at times, but it's a fun thing to do. I like working with kids and I've got a great bunch of coaches. It's funny, all my assistant coaches played for me and they're all winners and hate losing like I do. That's what we're trying to instill into our kids; you've got to be a good loser, but you've got to hate losing."